when left at the hands of mother nature? We'll find out. Here are pics today of my bundle left in the hands of mother nature. their bundles to reveal their evolution over time. The wind and rain have already taken hold. My patio may just turn into a rainbow of color. I'll be watching and photographing the process. 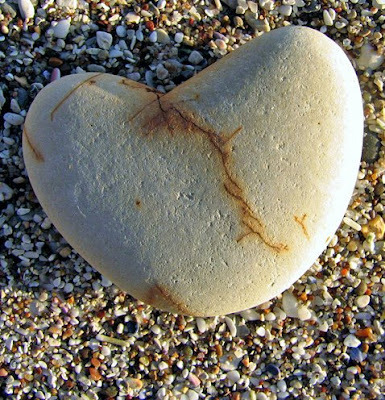 My other blogspot is here: The Way I See It"
I collect heart-shaped rocks. Are you surprised? Today should be like any other day, filled with love. My heart also lives here: "The Way I See It"
Still contemplating what I'll do with this piece. glimpse of the other side. medium. Gone but not forgotten. "A good laugh is sunshine in the house"
Hope you all enjoy your week. My other blog: "The Way I See It". A peaceful walk in the woods, deafening silence. of the hard-packed snow breaking beneath your feet. so you know you're alive. journey. My best and thank-you for your kind words. My other blogspot is here: "The Way I See It"